I have contempt for people who can read perfectly well but need pictures like a toddler needs its saliva-soaked comforter to keep their attention. But it seems the visual and not the literal is mightier than the sword these days. Palestinians were cheering on 9/11, black people looting during Hurricane Katrina, Michelle Obama as a be-afroed black radical and that Benetton ad. When L'Oreal puts out a picture of Beyonce as a blonde Mediterranean woman and then issues a brief two sentence disclaimer the following day - no prizes for guessing which has the biggest impact. So when it’s time to pick an image for the promotional flyers / posters to promote my latest play – this takes me on a journey. My play is about a black man, played by a black man, speaking for black men in the 60's. The first image I am sent shows a Malcolm X style cross covered in bling including a golden gun and handcuffs. I recoil immediately, p*ssed at what this image says about black men. I'm p*ssed at my producer, the designer and myself too. If this image says 1000 words about my play it says that all I've done is perpetuate some of the worst stereotypes of black men. It says that black politics come hand in hand with corruption and criminality. It says that Michael X was murdering pimp with Malcolm X style aspirations. And I'm going through all these different emotions, like God, maybe that's who he was you know - I mean, I didn't meet the man, he died in 1976. He was hung for murder. He did pimp women, he did like gold rings and wanted to be Malcolm X. But on the other hand, that's not what I was trying to say. I just wanted to demonstrate how hard it is for one man to speak and be heard, to be flawed and still try to be better, to bleed and still laugh. He also spoke about how hard it is to be a black man in Britain - dealing with people's perceptions and barriers. I realise I like that. I want everyone else to feel that when they look at the graphic for my play. I want them to question what it says about the black man and how they relate to that. I want them to discuss it before they even come to my play and then I want them to come and bring like three friends. And I want famous people to hear about this image and be inspired and come and watch it. Then the paparazzi will come and it will be an overnight sensation. Vanessa Walters is a UK writer. She has written two novels, Rude Girls and Best Things in Life. She has had several plays staged around the UK. She has recently published 'Smoke! Othello! ', a poetry collection about Afro-Caribbean experience in West London. 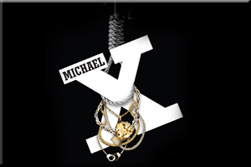 Her latest play 'Michael X' is on at The Tabernacle, Notting Hill Gate, London during November.